Earring styles go in and out of fashion depending in large part on whether current hairstyles cover or expose the ear. Earrings comprising gem and cut-out metal forms make their appearance in Rome, c. 2nd century B.C.E. 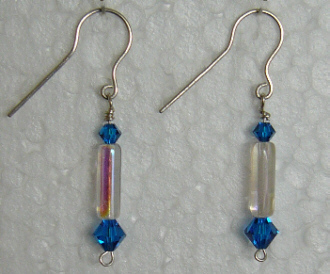 The iridised-glass beads have been coupled with blue crystals which are made by Swarovski, and the Sterling Silver connectors and ear-wires are handmade on the premises.